Thousands of Russians have protested in several cities against the government’s plan to raise the retirement age. There was a strong presence of opposition politician Aleksei Navalny’s supporters and the Russian Communist Party at a number of the July 1 protests. 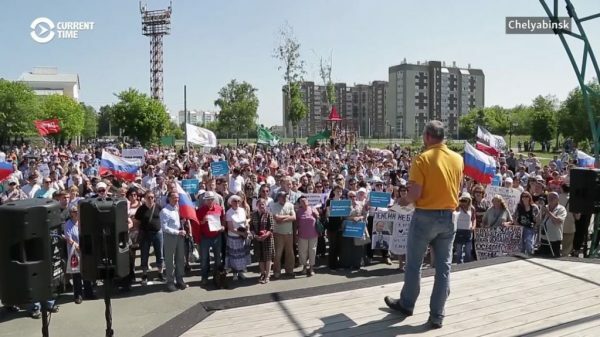 Current Time TV filmed rallies in Chelyabinsk, Tomsk, Kazan, Saratov, and Krasnodar. Thousands of Russians protested on Sunday over a government decision to increase the retirement age, but there were no demonstrations in the cities hosting the World Cup because of security restrictions in force during the tournament. Sunday’s protests were led by supporters of Alexei Navalny, the most prominent Kremlin critic. Navalny said his supporters staged protests in 39 cities across the country, from Russia’s Pacific Coast to Murmansk, near the border with Norway. Most of the rallies had been approved by local authorities, and there were no reports of arrests. Navalny published photos of the protests with people carrying placards with slogans including “Raise the pension, not the pension age!” and “Hands off our pensions!”. There were also some street protests organized by other political forces, including communists. Prime Minister Dmitry Medvedev, a close ally of President Vladimir Putin, said last month that the government wanted to raise the retirement age for men by five years, to 65 from 60, and for women by eight years, to 63 from 55. The reason given for the proposed reform was to ease intense pressure on state coffers. Critics say the retirement age in many regions is higher than life expectancy. According to some opinion polls, Putin’s approval rating fell to 69 percent from 75 percent after the plans for the retirement age were announced. Under a presidential decree issued to pave the way for the World Cup, Putin introduced heightened security measures in the 11 cities hosting matches. That gave additional powers to local authorities to ban demonstrations.